A passenger on a test ride of KT’s 5G bus tries a virtual reality (VR) head-mounted display (HMD). Korea, the world’s first country to launch the 5G cellular network for business clients last year, is preparing to kick start 5G service for consumers in March. Since January, KT has conducted test runs of 5G buses in Seoul’s Gwanghwamun area and near Gangnam Station in southern Seoul. The buses provide hands-on experience in the next-generation service to be launched. 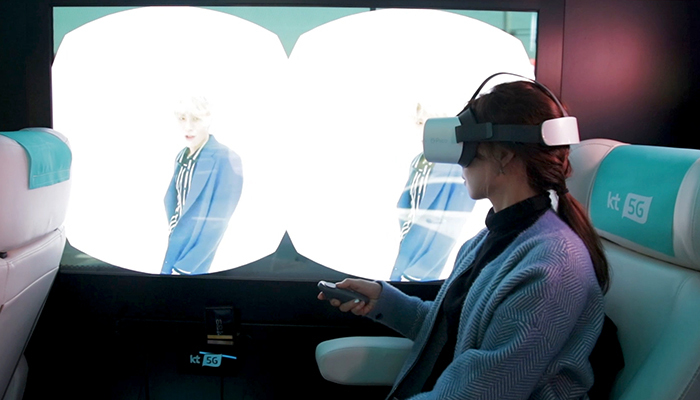 Korea.net took a ride on a 5G bus in central Seoul to see what was inside. Hopping on the bus, the first thing coming into sight is a 5G mobile hotspot router installed inside. 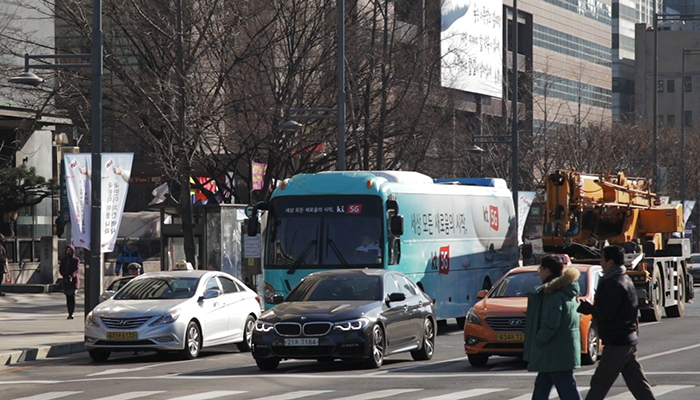 The device receives the signal from 5G mobile base stations in Gwanghwamun and the Gangnam Station area in Seoul and rebroadcasts it into a Wi-Fi signal, transforming the bus into a 5G area. Next to each seat are virtual reality (VR) head-mounted display gear, a remote control and a smartphone. A simulator app is installed on the phone to aid the VR program offered on the bus; the app takes up just 256MB. In an LTE-environment, an app bigger than 100GB must be operated on a smartphone. In a 5G environment, however, the program can be operated merely with the 256MB app complemented by real-time data streaming. This demonstrates the ultra-high speed of the next-generation network of 20Gbps, which is up to 20 times faster than LTE, meaning speed that is at least 10 times faster for users. In the past, songs were downloaded and played on MP3 players but faster internet speed led to music streaming services. Movies and TV shows, which also required downloading media files on devices, can now be watched via streaming sites. The 5G next-generation network can further boost VR and video games through its uber-fast speed. The 5G service is often mentioned together with VR and augmented reality (AR) as they require a tremendous amount of data processing for operation. The head-mounted gear on the bus takes the passenger to a basketball game. It feels as if the user is an invisible courtside spectator. The players on the court dribble the ball, pass right by to shoot the ball and block defenders. Watching the game on the court is so real that the user can feel dizzy. The VR program also offers the 360-degree, first-person shooting game “Special Force,” movies, entertainment and golf lessons with no lag. As the first country to commercialize LTE in 2011, Korea is expected to reassert its world-leading and cutting-edge information and communications technology with 5G’s commercial release to consumers from March this year. 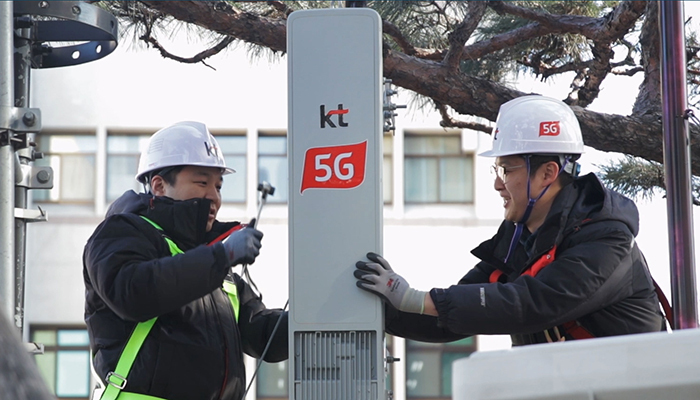 KT technicians install a 5G mobile base station in Seoul’s Gwanghwamun area. A 5G bus travels the Gwanghwamun area in Seoul.